There is no mistake about it ~ the Autumn Equinox was a very powerful event upon this planet. The equinox itself was not the surge of power, but with the Harvest Moon just a few days ahead, it helped to bring waves of light into the atmosphere of GAIA for each individual to experience it within their consciousness. We have to remember that it was orchestrated through many months of activations and trial and error of being on the Mastery Pathway. Without the preparation stages that occurred in December 2012 and the ensuing energies of New Moons, Full Moons, Eclipses, the Lion’s Gate, and the Star of David that occurred three times, we would not truly understand the full effect of the present energies that we are feeling. At this time, it is important to reflect how far we have come within this journey. We are going to be challenged even more deeply as time goes by. REFLECTION is very important at this time so there is a settling down of receiving the higher energies within the physical structure as we start to change into the Crystalline essence we have been desiring to be. We all know that this can be quite a challenge with our lifestyle and how it can change dramatically from moment-to-moment. More intense energies are occurring as we receive the higher chakras from the Rays of God to be infused into our present chakras. The physical body needs to accept the challenges it is feeling by surrendering so it is important for us to work within those energies of our Higher Essence to infiltrate within all aspects of the four-body system to allow the adjusting frequencies to become m ore balanced within us. Take time for reflection of who you were last December and what you are feeling now. Work with your Higher Self and call upon him/her to assist you in the process of understanding. Utilize higher methods of meditation and chanting to allow the vibrations to run through you. Be kind to the physical body; feed it when it is required, let it rest when it dictates, and flow within each moment. We are in the year of synchronization and now we are experiencing it more fully in our lives. Do not fight the process that you are undergoing on any level. Work with the Rays of God to accept the Light Body of the 5th dimension; ask your guidance to assist in the process. Continually put your thoughts and emotions into Wholeness by calling upon the Unified Whole Command of the 144th dimension. We are releasing each moment the timelines that do not fit so that the multi-dimensional self can be ignited. Most of all, do not get sucked into the Matrix and the media; we have to remember that the Dark Side is still at war on many levels and getting into confrontations about what we personally cannot change on a physical level, will take us into a spiraling energy of dysfunction from our past. If you insist on watching the videos, the news, etc. put that energy into wholeness of the Unified Whole. You will be helping the greater whole of consciousness to do the same. We will be coming into the New Moon on October 5th so take this time to regenerate yourself and prepare for the next change of an evolving planet. The continuation of the energies will be increasing so it is important to take moments in between to allow the adjustment of light to be infused in all parts of our Beingness. We also have to remember that not everyone is on the same level of acceleration within their initiations. We are all moving forward but within the confines of our Higher Self as our guide. Trying to compare ourselves with others is a lower frequency and not of the highest aspect within our role as a Master. Take time to understand who you are and share the energetics with others but not from words. This will bring us into Oneness together. Greetings and blessings to every one of you; It is our pleasure to be with you in this moment as the Unified Whole Command. We stand with many Beings of Light that have come into full Oneness and Wholeness since December 2012. We still represent whom we were previously but the pantheons of the past have been put into wholeness. We no longer are looking for our swords, our batons, and weapons that represented the battle of light and dark. We now stand with each of you to command the Light into the planet and within every individual soul. We have arrived at a new juncture of time. We are excited and pleased to see this moment and that it has arrived within GAIA so now she can do the healing that is necessary. The same is true for each of you. As of December of 2012, many were quite hopeful that we would come to this time when the Light was stronger than the Dark but we were unsure exactly how it would all play out within the hearts and minds of individual souls. Each of you has stayed strong in your convictions to hold this light; some may have been fighting very diligently to keep their ground upon the planet, and many have been hopeful that this day would arrive very soon. We must remember that it is just one moment when the battle has been won and know we must pick up the pieces of debris that need to be put into wholeness. Just as we have had elements arise from our pantheons, each of you will be doing the same. Your journey has been arduous and challenging; we totally understand the frustrations that you have been experiencing in each moment. Now is the time that we stand with each other in our convictions of the Light and continue the journey. The power of what has been accomplished is due to the lightworkers of this planet in continuing their search for truth. Many of you have found a small piece of this truth and more will be revealed as you walk further. We want to share this experience in terms of the Rays of God which some individuals may not understand but it is an imperative stage of development within your world. You have arrived within your body to remember all that you know from the many timelines of the past which reflect your knowledge and expertise. In order to understand this essence, it must be revealed that this is just a small piece of the pie that you have been searching for. More is to come and more will be revealed. We take this moment in time of the Fall Equinox in the Northern hemisphere and the Spring Equinox in the Southern hemisphere as a true exposure into the light. As in any exposure of the light, we must realize how this light is interceded within the physical existence. It becomes a very powerful source that is felt like an overpowering source, something that has not been experienced before, but yet is very familiar. At first, it can take over the physical existence but then there are fractals of information that are ignited within the physical creation to allow it to grow into more. It is like putting a stone into a body of water; it ripples out many levels so that the outer portion will be experienced by the inner portion expanding. This is exactly what you have experienced on September 22nd for the Equinox. You are in a state of expansion. So what happens within the expanded state when there are still elements that need to be changed? They will be revealed into the physical world; not by the lower energies but the higher energies. It is an opportunity for the Higher Self to be fully integrated through consciousness within the physical self which includes the Etheric Body clearing the timelines to allow for more expansion, and the Emotional and Mental bodies healing on very deep levels. This process can be very powerful depending upon where a person is within their initiation phase and how willing they are to delve deeper into themselves. The heightened energies of the Equinox is a preparatory stage for more energies to be integrated not only within GAIA but within each individual. It is up to each of you to receive the expansion and integrate it within your present awareness. It will allow you to understand more of who you are and let the frequency of light to always be your guide. What we are trying to say is that all of your pantheons can be put into wholeness also, but you must be willing to go through the process of the integrative energies and allow the understanding of your light and how it affects the old self that you were. Unfortunately, it is not just going to go away but will appear for you to work with and be accepted in your present lifestyle. Allowing yourself to expand deeper will give you greater understanding of the depth of your Soul’s essence and the history that you have acquired through the many timelines of existence both in and out of the body. Now if you just be still and accept the heightened frequency of light within you without understanding the process, this means you are in a comatose state of conditioning. You are not receiving nor are you releasing. You allow the light to be within you at the present state of awareness. That is fine for the time being but in the future moments it will be very challenging as this higher level of awareness will create an accelerated essence to occur in every individual. When the old elements appear to be removed, and they are not worked upon, they can grow like a dark seed within you. This is the illusion that can occur. So doing nothing or not acknowledging the process you are undergoing puts you in a place of inaction. The power of these energies is beyond the physical comprehension and the understanding must come from the higher essence of the mind and heart. Without those energies being integrated, there then comes a period of accepting the space and time that you are in, but there will not be any growth that results. Some individuals say that just receiving this light is enough but that is truly not the case. The ones that ignore what is happening within them will have a more difficult time to move forward. You see, this integration that has just occurred comes from the WILL OF GOD the first Ray of Will and Power within the deep colors of Blue. Without the influencing energies being infused within all levels of conditioning, it can stagnate and the Higher Mind will not be able to show its essence into the Lower Mind. It is all by Design for this occurrence as the more individuals that tap into the Will of God of their essence changes will result. By just allowing it to be within them without the actualization of the lower mind engaging the higher mind, havoc will result. It truly is a situation in what you would call Catch-22; the energies are integrating upon the planet and within each individual. Doing nothing allows them to sit within you but they don’t become a part of you. Working with the integration through the lower mind will assist in removing the old parts out of the physical system that are no longer needed. Each individual will receive this essence presently; doing nothing will make it grow through all the elements of the self. Inner work is a necessary part of allowing the energies to create the Crystalline structure and accept the power of light that is within each person. It is imperative to be in silence, meditate, read beautiful poems of light, looking at a sunset and allowing the energies to blend within you. People that are still enmeshed within the matrix and the dysfunctional world will feel it even stronger. They must get out of their own way in order to allow the new essence to come within their physical being. So the journey continues with each of us; those of us in Spirit, each of you in the physical. Our worlds are closer than we could ever imagine but the work must continue. We must acknowledge within ourselves what our role is in each moment. It may be to relax, to laugh and have fun, to be in silence, to communicate to our Higher Self, and to JUST BE. Each of you know within yourself what needs to occur. Allow your intuition to be strong and REFLECT on the old you and how you are changing within yourself. Your tools are very important as they will serve the light to create more light. Understanding will come to those that allow the silence of the physical mind to be their rule within their life. As a torchbearer, you have a responsibility first to yourself to allow this light to heal you more deeply than you ever thought possible. Yes, challenges will still result but with each activation within the planetary system, we become closer to each other within our understanding of the Higher Mind and accepting the role that you have decided to accept as a Light Being Upon the New Earth. It is our Divine Pleasure to be with each of you in this moment and to walk amongst you within the Light of the Heavens grounding into GAIA. We are the Unified Whole of Many Hearts Within Hearts. 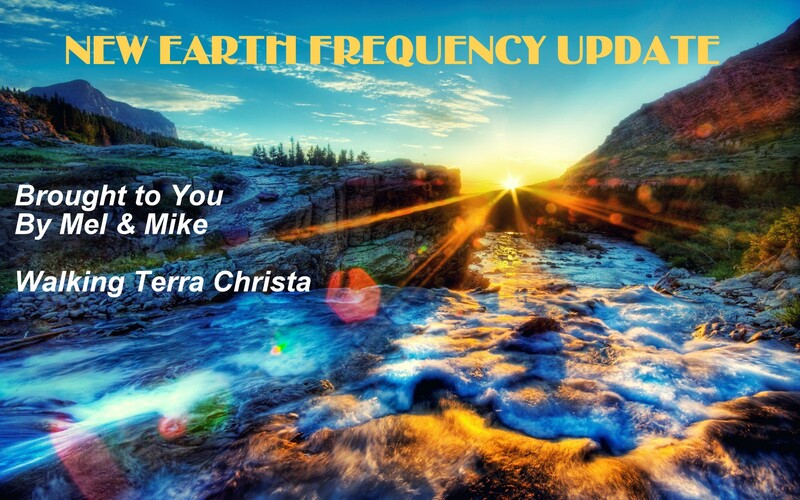 ©2012-2013 Walking Terra Christa Academy of New Earth Mastery http://walkingterrachrista.com by Rev. Christine Meleriessee and Mike Hayden. If you like this article please SUBSCRIBE, FOLLOW, LIKE US on Facebook or WRITE A COMMENT. Really love it? We certainly do appreciate your DONATIONS of support. Today, is September 11th and represents the remembrance of a day that we shall never forget. It was a day in which souls were lost upon this Earth, and a day in which would create a timeline within each of us that needs to be healed. There is much contemplation about why 911 ever happened. It is not my desire to delve into the history as that is something I feel needs to be healed. There is a huge programming scheme that went behind all of the events and many write about this in detail. I know that it was not all that we thought it was at this time 12 years ago. It is part of our illusion to think that we have not been used in some way by others. But that is the way history has been in the past. And now is the time to change it through the recreation of our existence of the Light. My goal is and always has been to help as many souls as possible to heal from any experience whether it is personal or global. I stepped into this pathway for this reason only and that is why this day is so very important to my soul. I was lucky enough not to know anyone personally that suffered from this terrible tragedy but at the time, I lived two hours away from New York in Southern New Jersey; we were deeply affected by the energies and saw the changes that happened as a result of the power struggle that occurred. My experience was on a energetic basis, but I was to take myself on a journey that would make it more personal. Many of you already know that I experienced a sweat lodge in Long Island, New York 30 days after 911 occurred in October. I was insistent that my group of friends attend this sweat lodge and had been trying for months. But it was to be my creation to be there one month after the terrible ordeal of souls dying in such a horrific way. Within the sweat lodge I, being the shamanic woman I am, went into the Astral level of the earth and found many souls hurting hanging around not knowing what to do. I was met by one soul, Fred who was a Fire Battalion Chief and he was very stubborn to move forward. His pain was great but his soul was expansive with a deep compassion of helping others. You see, he did not know how to help himself, but our meeting would take us on a journey together that would help millions of souls to heal. Neither of us knew the magnificence of our meeting. It seemed that I needed to experience part of his pain so I came back into my body on the 3rd round and fell into the rocks burning brightly. I had been seeing this heart in the embers through the entire ceremony and as I fell the heart was imprinted upon my right upper calf. The pain was excruciating but the emotional turmoil was worse. I cried for quite some time as healers came to my aid. 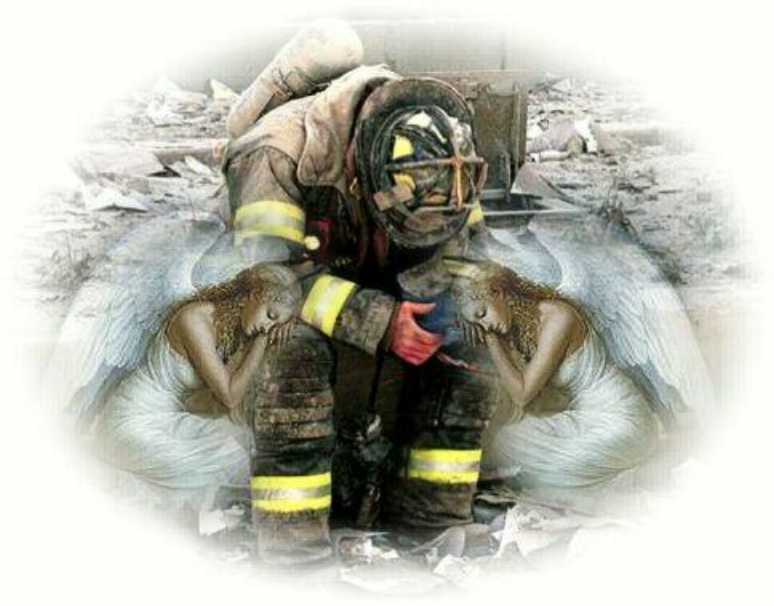 I became emotionally, mentally, spiritually, and physically involved with the tragedy of 911 on that day. I was able to heal my leg through a couple months of healing therapy but I was deeply changed. In 2002 I received a message from Archangel Michael through my computer (voice activated), “We are ready”. At the time, I had no idea what was to be except I sat and received the message. A temple of healing was being constructed in the Innerplane levels to help souls to heal. 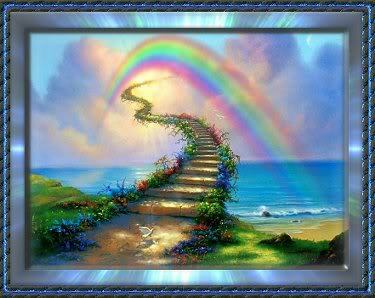 Originally, I thought it was the souls that were healing from 911 to help the Earthplane souls which was partially true. In my consciousness I did not realize the magnificence of this temple until the years passed. We created a weekly group in which individuals could connect with the energies and I would transmit a message from the temple walls. Fred became the Spokes-Being of the temple and would introduce the energies. I channeled different Masters, Angels, and Light Beings that wanted to give healing to the earth. We also connected with the souls that needed healing. People had personal experiences with different souls of their inflicted wounds. The temple was flooded with souls through Archangel Michael and myself (on the Innerplane level). You see, each soul had to pass some tests to make sure they were not bringing in lower frequencies of anger, hurt, despair, etc. The temple would house healing for each of these souls. A viewing booth was created so that each individual soul could check it out before they embarked into the temple themselves. Archangel Michael and others worked with the souls to help them in their healing process. The Temple grew from the Universal Level into the Multi-Universal level which meant that it consisted of not only souls from earth but many planetary systems that wanted to be in Oneness. Originally we called it The Clarion Temple of 911 and Beyond. We added beyond when we realized that many souls were leaving the planet from the resulting war after 911 and more tragedies happening. Fred healed extensively through all the years. We are very interconnected and he even came to a group of friends and myself in one of our trips to Mt. Shasta. It was a very magical trip in which we were connecting to the Telosian Community with Lord Adama and we were gifted with a dinner in which some souls were our family. It seems hard to believe but it is a moment in which you have to experience yourself. Fred, was in the dining room and he smelled of someone on fire. My friends noticed it immediately and I will never forget the look in his eyes. You see, Telos, is a very special place and many souls are able to travel there after death to rejuvenate themselves. They are able to create a body. On this night I was gifted to not only see Fred by my parents and sister. Later that evening my friend channeled Fred and I worked with his subtle body to heal the fire that was within him. Some may not believe this to be true but in this moment, all that were present, received the gift of magic ~ seeing two worlds come together. In 2012 when Mike Hayden came into my life, Lord Sananda asked us to take one of the other calls, The Cosmic Oneness, and combine it within the Clarion Temple. He said that the temple had come into full unity and they wanted to include the Great Central Sun (Divine Mother and Father God) energies within the Temple. So we called it the Clarion Temple of Oneness. It was at this time that Fred ascended. He used to speak in the beginning of our meditation introducing the light beings. He now does not have this job but awaits for us when we walk into the amphitheater and guides us to our seats in the first row. He is the overlighting energy of this temple and his name is now Yamteleus. So we now meet with the Angels, Cosmic Great Central Sun, and the Unified Whole of the Overlighting Spiritual Hierarchy each week to receive a message on the energies. We invite any souls that we know have perished during that time to join us. We have had many surprise visitors, like Michael Duncan, who played in the move, “The Green Mile”. He spoke in the temple right after his passing this earth which was the first time anything like that had happened. Michael Jackson is also very prominent within the temple among many others. We then send the energies into the Earth to help with the healing of all souls. Individuals can have their loved ones be in the temple whether they are within body or in the heavens. The temple is always open so you can ask to go to the temple in your dreamstate and receive the healing. Fred and I are always connected no matter what level each of us shall achieve in our soul’s pathway. I helped him and he has helped me. We have assisted countless of souls to heal so much quicker than we ever thought would happen. There is a saying that, “There is a silver lining within each moment no matter how deep the pain may be.” The Clarion Temple of Oneness is my silver lining with Fred/Yamteleus. I endured great pain during that time to be with a soul that I was to connect with and needed to do the work. It would never have happened without Archangel Michael pushing me to be at that Sweat Lodge on that date. Some have said that this temple is the hugest endeavor within all of the heavens for healing souls. That warms my heart so deeply. It is my deepest pleasure to see the changes that have occurred within the earth at this time. The Clarion Temple was meant to be and Meleriessee endured much to be able to transmit the energies. 911 is a tragedy that needs to be healed in all of the minds of all of the people of this earth. It represents the control and duality that has been inflicted upon the planet for eons of time. It is a moment in history that no soul will ever forget whether they are in the physical or an ascended being of Light. We all hurt deeply from the tragic moment that was created. What we need to do is to embrace our Light as deeply as we can; to not be in fear, anger, or lost emotions that get in the way of the healing that needs to be done. Fighting with others is n ot the way to the healing of this Earth. We need to embrace ourselves with the essence of Light that we are and then bring it onto others. The ones that have caused this to occur will pay dearly for their ways as the ways of darkness are no longer the rule upon Gaia’s lands. You are changing all of this; each of you sparking the light within you each moment. That is how we are going to bring it all into the Light and move it out of the darkness. The Clarion Temple of Oneness has been guided by the Grace of God to assist as many souls as possible through the healing that needed to be done. Souls that arrive are guided to the right spaces on the Inner Plane to receive the transformation that they did not accept on the Earth plane. Souls upon souls have entered the temple for 11 years and continue to do so each moment. It is a permanent structure within God’s Universes to allow the acceleration of light to be infused upon them and to each of you. We are deeply grateful for the commitment of each of the masters that speak, the healing angels that assist, but mostly for Meleriessee for staying strong and continuing this weekly connection. Join us as you will not be disappointed. We need as many spiritual leaders as possible to continue the deep healing that is needed and can be found only within this temple of light. The temple is for each of you and each of us in all realms of Light. Join us September 11th, 2013, 5 PM Pacific for a powerful connection meditation LIVE in the City of Telos as we honor Fred/Yamteleus and all the souls that have healed through this process. This is an open call for everyone. An MP3 download will be available. You may read the transcriptions of the Clarion Temple of Oneness, http://clariontemple911.com, and the Cosmic Oneness, http://cosmic11oness.com, which is the message shared from the Cosmic Great Central Sun. You may also join the calls weekly on a call-by-call basis, http://walkingterrachrista.com/classes/, or join our membership program, http://walkingterrachrista.com/members/. I thank the Ascended Masters, Light Beings, Archangels, Inner Earth Beings and the Unified Whole for sharing their loving support to my pathway. Without them, I would not be sharing in this moment and it has made my life a Living Dream in each moment.